A degree in electrical engineering opens new opportunities in the field of cutting-edge electrical and electronics solutions. The main duties of an electrical or electronics engineer include working with multimedia, telecommunications, electric power, signal processing, and control systems. All of these skills produce automated cars, robots, aviation electrical systems, new forms of wireless communication, and other not-yet imagined products and software. There's no limit to how electrical engineers can improve and invent ways to help make life easier and safer! According to The Bureau of Labor Statistics, the mean annual wage of electrical engineers in May 2015 was $97,340. The lowest 10 percent of electrical engineers earned $59,240, and the highest 10 percent earned more than $146,820. Employment of electrical and electronics engineers is projected to grow 4.5 percent. Job growth is expected because of electrical and electronics engineers’ versatility in developing and applying emerging technologies (Bureau of Labor Statistics). Our department teaches students the latest in robotics, electrical currents, radar, microwave technology, wireless communications, and more. Walk in the footsteps of Nikola Tesla and Charles F. Kettering by developing new solutions to engineering challenges. Look at our Research to learn more about our faculty's work. View a full list of Electrical Engineering courses with descriptions. The IEEE has named Wright State professor of electrical engineering Brian Rigling as a Fellow for his contributions to synthetic aperture radar imaging. Matthew Scherreik, who is pursuing a Ph.D. in electrical engineering, won the Lockheed Martin Best Student Paper award for the third year in a row. 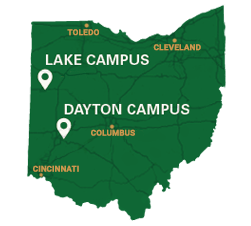 U.S. News & World Report recognized Wright State's graduate programs in engineering and nursing.